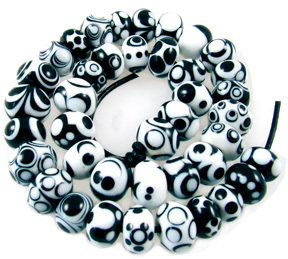 You may make spectacular beads but still have the same problems occurring in every bead. You might be just starting out and feel like you don’t have a handle on things just yet. Either way it all boils down to your ability to control the glass. With control of the glass you can make your simple beads and your fancy beads even better. My goal is to share a few of my essential magical tricks to put you in control of your beadmaking. Plus Two Tiny Tips FREE! Choosing a Beadmaking Class & Making it Great! You’ve always wanted to take a beadmaking class but it’s a big investment and you want to spend your money wisely, right? What tools does Heather Trimlett use? I have always enjoyed making marbles with holes in them. To create them, I used a marble mold for shaping them for years and while this was a great use of a standard marble mold I wanted more. This prompted the design of my ROUND-UP Tool. Think about making pancakes or cookies; often the first batch does not come out perfectly, but the more you cook the better your results. Shaping beads in the mold can be like that. Often the first one is a bit wonky, but then you get a rhythm and your results improve. Most of my students experience rapid success—I’m sure you will too! Yes, there are lots of choices when it comes to tools for making twists, stringers and doing off-mandrel work. Having spent thousands of hours making this type of work, I finally created the Trimlett Twister Tool, a tool that works for me and am excited to share it with you. Like any other new tool, it will take some practice. Heather shows you just how easy it is to make a hollow bead with her Groovy Tool. Lots of great photos! *These downloads are PDF files. You'll need Adobe Acrobat Reader to open them.